During yesterday's Nintendo Direct presentation, we learned that The Elder Scrolls V: Skyrim would be coming to Nintendo Switch on November 17. Most of us didn't need any more information; we're sold. The pickier among you have been wondering whether or not this version of Skyrim would be based on the Special Edition or not. The question of mods has come up frequently as well, since the PS4 and Xbox One version of Skyrim Special Edition have limited mod support. We have some good news and some bad news for you guys. According to Bethesda's official site, the version of Skyrim we're getting on the Nintendo Switch is in fact based on the Special Edition. We had a pretty good feeling that it was, because the lighting and textures looked much improved over the Xbox 360 and PS3 originals. The performance has also looked pretty rock solid, with stable frame rates in every recent gameplay video in third and first person. So that's the good news. 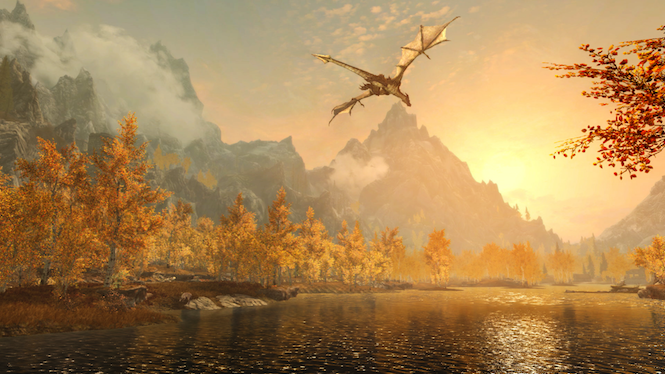 The bad news is, Skyrim on Switch will not have mod support. Not out of the box, anyway. US Gamer's Matt Kim asked Pete Hines specifically about mod support. "Not as this time," was his response. The door isn't shut completely, but if I were you guys I wouldn't get my hopes up for mods any time soon. Still, there's more than enough content in vanilla Skyrim (and its DLC) to keep you occupied for several hundred hours. Right when you thought you were finished with Breath of the Wild and ready to call it quits on open world time sinks, this sucker comes along and wrecks your social life again. And though it's missing mod support, the Nintendo Switch version does come with a few neat exclusive features, including motion controls for lockpicking and combat, Legend of Zelda gear, and bonus loot unlocked by using compatibly amiibo.